Please note due to high levels of Spam you now have to be logged in as a member to ‘Leave a Reply’ in any comments box. You will find a ‘Leave a Reply’ – comments box at the bottom of most pages, on the ‘News/Blog’ page click on the ‘speech balloon’ next to the posting you wish to comment on. It’s simple to use just enter your name and email address, add your comments and click ‘Post Comments’. Your comments will be published once approved by a committee member. If you want to have a go at leaving a comment use the ‘Leave a Reply’ box below, write anything you like, within reason that is, and I’ll post a reply. Why not make it much easier by having a login profile setup for you. Then once your logged in your comments will be published immediately. You will also be able to update your own profile, add your own profile image and message all or individual members. Simply fill in the ‘Members Login Application‘ form. Once your profile has been created simply log in by going to the ‘MEMBERS LOGIN’ , which is at the top of the righthand menu, and click on Log in. You will then be asked for your ‘Username’ and ‘Password’, which I will have sent you, then click the Log in button. If you click on the ‘Remember Me’ box your computer will remember you details for when you log in again. Please remember that both your username and password are case sensitive. You can also login, control your status and profile by using the tool bar at the top of the website. On the Admin screen you can change your profile details by clicking on “Profile” as indicated. Don’t forget to click on the “Update Profile” button at the botton of the page to save any changes. You can change any of your details apart from your User Name. You can also upload a profile image or “Avatar”. I do recommend you change your password. 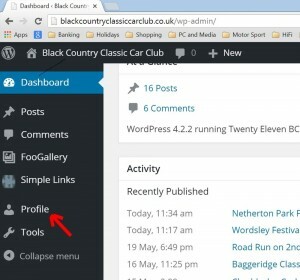 To get back to the main site whilst remaining logged in click on “Home Black Country Classic Car Club button” as indicated. 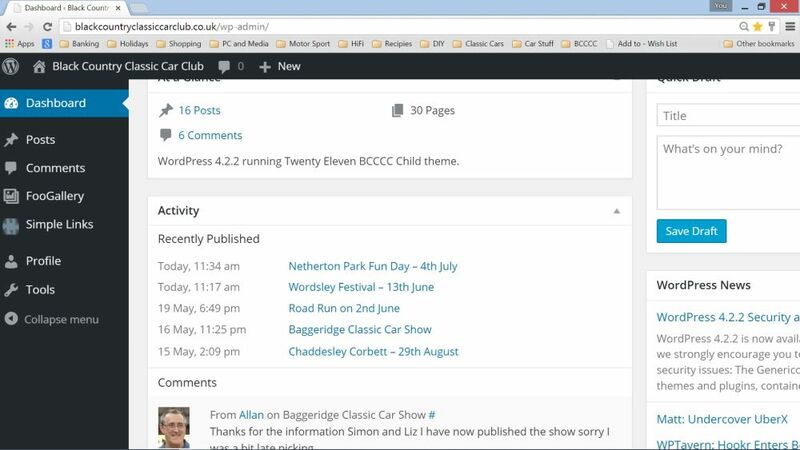 If any club member would like me to setup a login profile for them simply fill in the form on the ‘Members Login Application‘ page or catch me at one of our Tuesday meetings. All I require is your full name and email address. I have also setup a ‘Members Cars’ feature which provides any member with a page on the site to display a gallery of their car or cars. There is more information on how to get your gallery setup on the ‘Members Cars’ page. There is a search facility on the top righthand corner of all pages. This will search the hole website no matter which page your on at the time. So if you can’t find anything enter a related word or words in the search box and press return. Then click on the most relative search result. I will be adding more information here but in the mean time if you need help or guidance ‘Leave a Reply’ below, go to our ‘Contact Us‘ page or catch me at one of our Tuesday meetings.